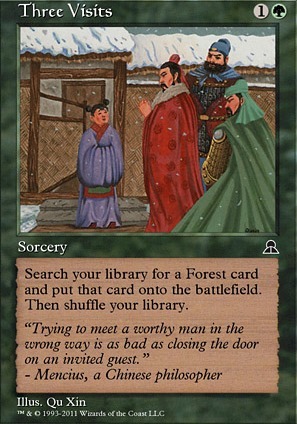 Search your library for a Forest card and put that card onto the battlefield. Then shuffle your library. Hi there, first thing that I would suggest is cut your Force of Will it's a powerfull card but in my opinion you have too few card's to pitch for it and most of them are too essential so Counterspell would be just better in this deck. Also some rampspell's could also help,because you have such a strong manabase you should prefer cards like Nature's Lore , Three Visits or Skyshroud Claim over Cultivate effects. Cryptolith Rite should also give your welcome redundance of the effect of Manaweft Sliver in enchantment form. Depending how much you still want want to spend Alluren is strong with this tribe and you would definetly get The most out of it on your table,if you want to add it you should look for more Big carddraw spells like Windfall cause your hand will be fast emptied. PlatinumOne on Why Rampant Growth is bad. SynergyBuild: "i named a card that beats rampant growth in every scenario"
not quite. you listed cards that had an advantage in one aspect, but not all. 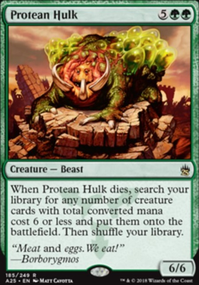 all of the cards you mentioned either cost more money, or did not color fix in a way that is resilient to removal. if you really don't see the relevancy, then YOU are the dumb one. i literally could not have made it any simpler. budget decks that use 2+ colors are not "random" scenarios. they are quite common. i'm not spending $84 on Three Visits , and Llanowar Elves does not give non-green mana. quite literally, the entire basis of your argument is " Rampant Growth is bad because you should either be spending an amount of money equivalent of a used car on your deck, or you should be playing mono-green". what about the players that want to do neither? they play Rampant Growth . bushido_man96 on Why Rampant Growth is bad. I can't run cards like Three Visits . That's too damn much money for me to go spend. So budget becomes a consideration. Its also very easy to point out how good Exploration and Burgeoning are, especially with their price tags. I've got one copy of Exploration left, so I'm going to be choosy about which deck I put it in. If that means I've got make a choice for a card like Rampant Growth , then that's how it goes for me. Non-budget options out of the way now, yes, you are correct that there are better options than Rampant Growth , that have better flexibility with the lands you can search for, and don't come into play tapped. Those are better. I think it ends up coming down to how many of that kind of effect a deck wants/needs. With all that said, I'm not in disagreement with you. You've made very valid points, and like I said, you're preaching to the choir here; most of the time (most), I prefer rocks and dorks for ramp when I can run them. But I see why some people run Rampant Growth . Another thing I notice is that some people, for some reason or another, just prefer run "spell ramp" as opposed to rocks. I don't know why, but some just seem to gravitate to it over rocks. 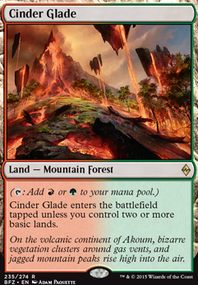 I think the sorcery ramp spells can be more helpful in fixing mana over time, but I still prefer rocks and dorks. SynergyBuild on Why Rampant Growth is bad. Ramp, card draw, and fatties are the 3 cornerstones of EDH as a concept to many players. Rampant Growth , Rampant Growth is the symbol of one of these three cornerstones (I am sure you'll never guess which one). I am here to tell you, despite what you may have been told. It is bad. Really bad, not even medium bad like Cultivate (Yes, I hate that too, outside of some specific lists like Tatyova, where it belongs to some extent). Why? Well, to start, mana production. 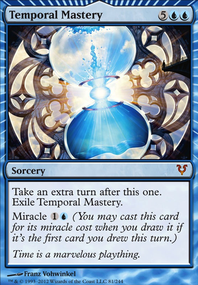 It doesn't give you mana immediately without Amulet of Vigor , unlike 2- mana manarock variants like the signet cycle ( Azorius Signet , Gruul Signet ), talisman cycle ( Talisman of Indulgence , Talisman of Progress ), Mind Stone , Prismatic Lens , Fellwar Stone , etc. So? Many decks are mono-colored and can't use signets, or talismans, or have cards like Null Rod / Kataki, War's Wage , etc. or go up against them often. Rampant Growth gives a land. 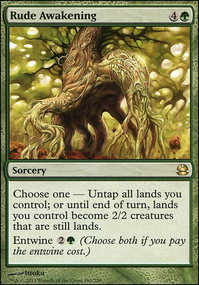 Well, Nature's Lore and Three Visits both give you an untapped land, they can hit Shocklands or Duals to get your colors better than Rampant Growth , and generally are pretty good. What else? Growth Spiral , Explore , Sakura-Tribe Elder , Farseek , etc. all do Rampant Growth better, and aren't even good. None of these are great cards. Llanowar Elves , Fyndhorn Elves , Birds of Paradise , Elvish Mystic , Boreal Druid , etc. all do it for half the mana, a turn faster, and are in green. How is a 2 mana card better? Fast artifact mana or land mana like Mana Crypt , Mana Vault , Sol Ring , Chrome Mox , Mox Diamond , Ancient Tomb , Gemstone Caverns , etc. all do more work in almost all cases. Enchantment mana like Wild Growth , Utopia Sprawl , Fertile Ground , Carpet of Flowers , Exploration , Burgeoning , etc. Even Broken Bond or other cards with ramp attached can do more work. Farhaven Elf or Wood Elves with an elf-tribal deck, or dorks, etc. So, with all of this, is there any real reason to run the cancerous growth (see what I did there xD)? Yes, price. Rampant Growth is ~20 cents right now. Sure Gruul Signet , Golgari Signet , Simic Signet , Prismatic Lens , Llanowar Elves , Fractured Powerstone , Moss Diamond , Growth Spiral , Explore , Coiling Oracle , Broken Bond and tons more examples are equal to it or cheaper, but I am aware someone will bring it up. There are too many better cards for lands-matter decks to use it, and too many are cheaper, equally cheap, or better and worth the cost to claim they are the reason Rampant Growth should see play, etc. Seriously. If you run this card, stop. Heya Kizder, Mayael is a great commander and she can definitely be great as she is essentially a free card advantage engine. However the biggest issue that I see in these kinds of deck is that they tend to push for more of the go big and wide strategy. The downfall to this type of deck style is that your deck CMC gets way too high, your hand gets cluttered with too many big drop creatures, and your curve won't work out smoothly. 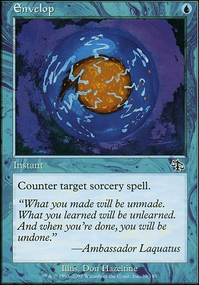 I would suggest more ramp spells and more tutor cards to make it as efficient as possible. Cards like Search for Tomorrow , Nature's Lore , Farseek , Rampant Growth , and Three Visits are worth the slot to help you ramp. 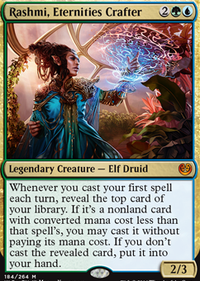 Mana dorks can be considered but if you want to not dilute the creature density than I would at least recommend running Bloom Tender as she does produce quite a bit of mana for small investment. Aside from the cheap low drops, the other value cards I would consider running would also be Cultivate as well as Kodama's Reach as they replace itself after ramping so that is more card advantage essentially. Next part aside, is while you do have Scroll Rack and Sylvan Library that is not enough to manipulate your hand from having creatures stuck in it, you can also essentially use cards like Elvish Piper or Quicksilver Amulet to also cheat away your creatures from your hand. You can also do an interesting way with Sneak Attack as well. Why run Three Visits when a foil Selvala, Heart of the Wilds is like 50 bucks more xD? Landsearch: Nature's Lore , Three Visits , Farseek , Sakura-Tribe Elder , Wood Elves and the slower Cultivate , Kodama's Reach and Skyshroud Claim . Dorks: Llanowar Elves , Elvish Mystic , Birds of Paradise , Priest of Titania and Selvala, Explorer Returned . Rocks: Sol Ring (must have), Mana Crypt , Selesnya Signet , Talisman of Unity , Mox Diamond , and Fellwar Stone . 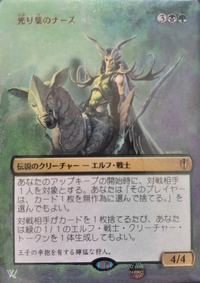 If you're going to run Life from the Loam , you could look at Ramunap Excavator , however for either card I would recommend increasing your fetchland count. If you can get all seven then great, however I appreciate that like some of the other recommendations here, they can be quite expensive.